A happy workplace is not something that happens by accident. It’s the product of both physical and intangible changes that makes a more harmonious workplace. Here are 10 things you can do immediately to create a better office environment. Nothing beats a bit of natural light in the office. Make the office feel fresh with some plants. 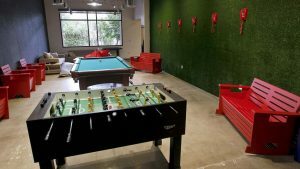 Blow off some steam at the office pool table, like this one at Virgin Media. Your employees spend a good portion of their day at their workstation, so let them decorate their area in ways that are personal and appealing to them. 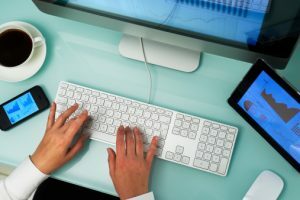 This may mean choosing a standing or adjustable desk, an office chair or a stability ball, and an ergonomic keyboard and mouse. They should feel free to adorn their cubicle or office with personal photos, plants, and desk lamps. When we customise our space, we feel more of a sense of pride, and that pride will extend to everything we do at work. 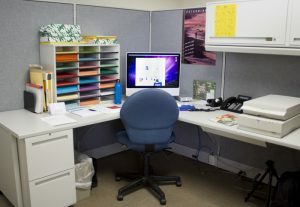 A few additions such as a picture of loved one, some bright colours and room for creativity lead to a productive space. In study after study, workers consistently report that meetings are their biggest productivity killer. The average professional goes to 61.8 meetings per month, 63 percent of meetings don’t have an agenda, and 73 percent of people are doing other work at meetings. Whenever possible, communicate through email, a centralised whiteboard, or other methods that don’t pull people away from projects. Death by powerpoint, or lacking productivity? Either way, meetings without a reason are the worst! Designing a comfortable office environment is about more than aesthetics; careful attention to design can give a boost to employee happiness. In the current economy, the focus is often on leasing office space based on price, with less attention paid to design, layout and amenities. Smart business leaders, however, think beyond the existing layout and furniture options when moving into a new office or refurbishing a space. 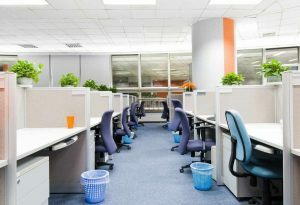 “That fresh coat of paint and new carpet your landlord gave you when you signed the lease is great, but there are other small investments of time and money that can transform your office into a more productive workspace…” writes Lois Goodell, principal and the director of interior design at CBT Architects, in an Inc.com guide on creating a productive office environment. In short, making a comfortable environment takes more than a sturdy desk and comfortable chair – it incorporates quality lighting, good ventilation, and a quality heating-and-cooling system. When the basics of a functional office work flawlessly, and when complaints regarding technology and equipment malfunctions are answered and remedied quickly, that goes a long way to making employees satisfied with their surroundings. But you’ll want to go several steps further. “Companies should take advantage of the research and give thought to furniture design and how it fits the needs of employees and their work habits,” writes Goodell, who also suggests the space should be wired to support Wi-Fi to maximise the space’s flexibility. 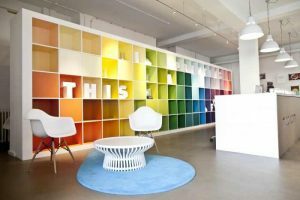 But don’t let utility override personality: Remember, your employees spend more time at work than almost anywhere else, so “it should be a comfortable and inspiring environment,” with wall colours and art that support your company’s image and culture. 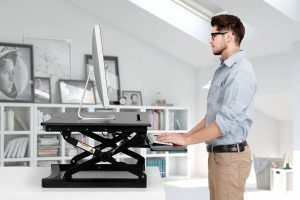 Standing desks are a brilliant way to help you feel more energised. 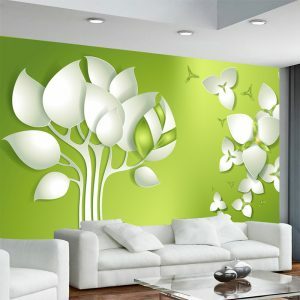 Increase creative thinking with green walls. We’ve seen nine tips on easy ways to make your office space a little better for productivity and employee engagement. Yet one thing we’ve not mentioned is bringing in an outside expert for some advice. Since 2007, Boss Stationery have helped hundreds of businesses create a dynamic, flexible, practical space within their office environment. We can offer a complimentary survey of your office and suggest ways you can make your office better. Get started by visiting www.bosslimited.co.uk or call 01756 793003.